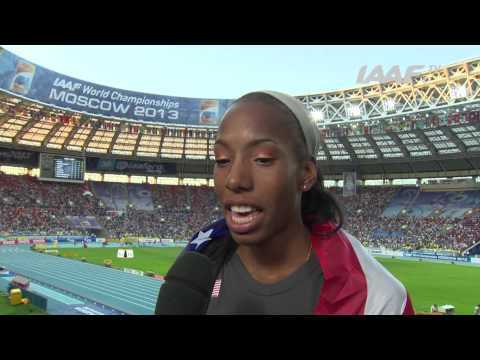 Welcome, Olympic Silver Medalist Brigetta Barrett here! Flying through life each dream a cloud visited and an accomplishment unforgettable! Follow me as I prepare to do it again, but this time I'm going for GOLD! Join the journey and be inspired to create your own! Born in Wappingers Falls, NY, Brigetta attended Duncanville H.S. in Texas and received a scholarship to the University of Arizona. While competing for the Wildcats, Brigetta was a regular on the podium, bringing home Indoor and Outdoor NCAA Championships in 2011, 2012, and 2013. She began to see national and international success in this time as well; the two-time USA Outdoor Champion earned a World University Games title in 2011, an Olympic silver medal in 2012, and a World Championships silver medal in 2013, all while finishing her degree in Theater Arts. Driven to success, Brigetta is a free spirit who believes nothing is impossible to anyone willing to do what it takes to succeed. She is guided by her Christian faith and hopes to live in such a way that inspires others to follow Christ as well. A legitimate showman, Brigetta loves her fans and enjoys creating an experience in appreciation for their support on and off the track. She knows that through her athletic stature, she is a role model and seeks to embody kingdom principles and good character, honored to help anyone achieve greatness in any way she can. Brigetta hopes to inspire and help those with limited resources to pursue their dreams, as she overcame the adversity of poverty and fatherlessness to reach her level of success. Brigetta's off-the-track talents are also recognized, as she is frequently requested to sing the National Anthem for the events she enters.